Welcome to my website, your source for the information necessary to make informed real estate decisions in Milford, Connecticut and the surrounding towns. The sale and purchase of a home is very personal and often stressful. My goal is to understand your needs, provide personalized and professional advice, and make your real estate experience as stress free and profitable as possible…an experience you couldn’t find elsewhere. Please contact me to see what sets me apart, why my clients are so pleased, and how I can help you meet your real estate goals. 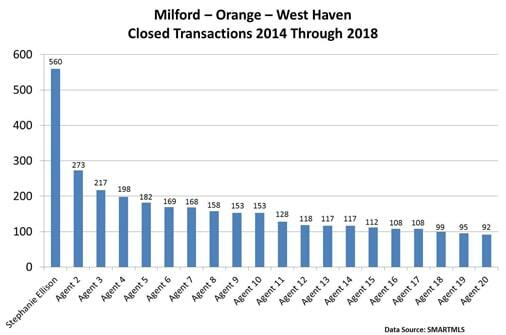 Since 1990, no one has sold more homes in Milford and the surrounding towns, and I would be honored if you were to choose me to become your trusted real estate advisor. Highly likely to recommend ~ Stephanie Ellison is the best choice for anyone looking for an agent to sell a home in New Haven county. This was my first time selling a home and Stephanie and her team were very responsive to any requests and issues that came up during the process. Her knowledge of the area and past experience allowed her to handle problems with ease. Stephanie’s relationships with other realtors in the area incre	ased the home’s visibility on the market and the number of showing requests. She also recommended an excellent cleaning service and law firm for the closing which made the process as smooth as possible. Finally her advertising reach is unparalleled to her competitors and was a key factor in the sale of my home to out of state buyers. Simply put, Stephanie should be any home seller’s first choice. No one else has her knowledge or capabilities.